I know that Sunday is traditionally a day where families come together for a big meal, that has been roasting away in the oven all morning long, filling the house with delectable flavors! Well, to be honest, that is not how things play out at our house! On Sunday, I wake up early in the morning, get dressed, and have to be at church at 8:30 am for worship practice. Then, I have Sunday school at 9:30. After Sunday school, it is service at 10:40. We get home around 12:30, and by then I am exhausted. That is why, on Sundays, I like to go for simple dishes with hearty ingredients, and big flavor. Chicken stir-fry is one such dish! It is a perfect one pot meal, that is quick, filling, and is full of flavor! Let me show you how it is done! To begin, you will want to pour 2 c. of water into a sauce pot, and bring to a boil. cover, and let cook for 15 minutes. Now you will want to take a moment and prep your vegetables. Remember, successful Asian cooking is in the prep work. Everything is at high heat, and cooks fast, so you have to be prepared. brown sugar, ginger, and cornstarch. Next, add 2-3 tbsp. of oil to you skillet and turn heat to high! You are going to want this skillet SMOKING hot! First thing you will add to the pot is your eggs. Immediately begin to scramble with your whisk. Now, add your carrots and cook till tender. Next, add the peas and cook till heated through. Here I had some left over edemame so I used that instead. when it comes to any kind of stir-fry. Once your vegetables are tender and heated through, add the garlic. Cook until you smell it coming from the pan. Then, you will add half of your green onions. Let them begin to tender and heat through. Next up, the chopped chicken. I made the other day, but you can use any kind you like. Just make sure it is fully cooked and chopped. 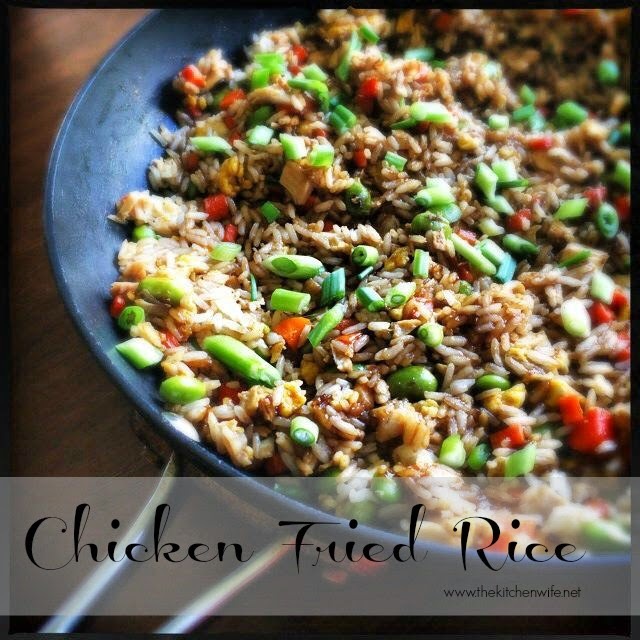 Your rice should be cooked by now, so add it to the chicken and vegetables. Stir everything together with a rubber spatula. sesame seeds if you want, and serve. Here you have it, a quick, easy, and FUN meal perfect for Sunday or ANY day of the week. Even if you live alone, call up a couple friends, invite them over, bring this pan to the table, gather everyone around, and hey, forget the plates! Just spoon it out and enjoy each other's company, because the most important part of any meal, no matter what day it is, is who you share it with! Bring 2 c. of water to a boil in a sauce pot. Add 1 c. of rice, lower to a simmer, cover, and let cook for 15 minutes. Place skillet over high heat. Add two eggs and scramble with a whisk. Add the carrots and cook until tender. Add the peas and let heat through. Add garlic and cook until you smell it coming from the pan. Add half of the green onions and cook until tender. In a measuring up, combine soy sauce, cooking sherry, brown sugar, ginger, and cornstarch. Add the cooked rice to the skillet. Pour sauce over the stir-fry and stir.